Broker Brain now allows you to customize some of your screen colors using the Primary Color, Secondary Color, and Logo Background Color fields within the Site Settings screen. The diagram below shows the areas that will be impacted by a color change. Primary Color - Company title bar background and color of the sub tab names shown in the navigation bar at left (shown as burgundy in the screen shot below). 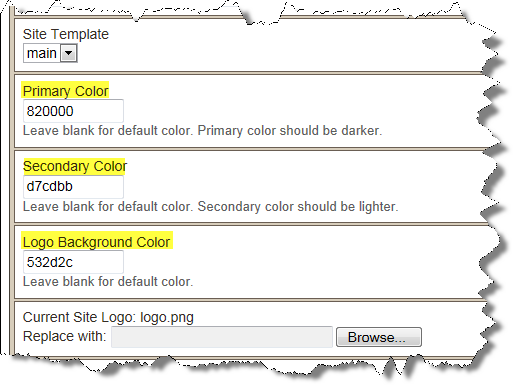 Secondary Color - The background color of the active screen title (Site Settings in the sample below) and the lines separating each section (shown in our sample as tan). Logo Background Color - The area behind the company logo shown in the upper left-hand corner (ours is brown). 1. From the Admin tab, click the Site Settings sub tab at left, then select the General sub tab at right. 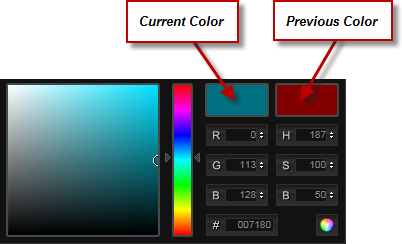 Before you make any changes, be sure you write down the number of the color that is currently shown in the color field you are changing, as once you update the screen there is no way to get the previous color back. However, if you know the previous color's number, you can type it into the appropriate field and reset it that way. 4. Click and drag in the rainbow colored bar at the center of the screen until you find the desired color. Note: You can also click and drag the circle shown in the colored area to find different shades of the selected color. 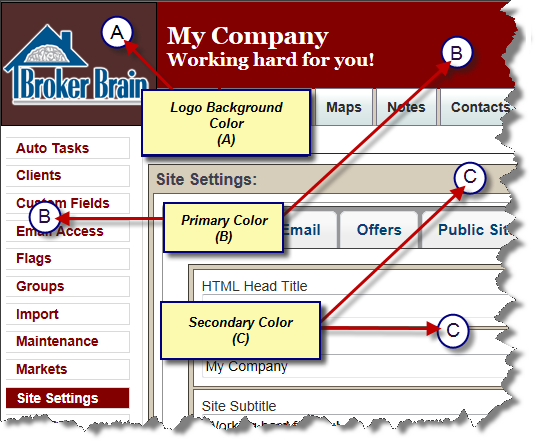 If you wish to use the color scheme shown in the diagram at the top of this page (Broker Brain's original color scheme), click in the desired field(s) and type the numbers shown in the second screen shot. 5. When you have found the desired color, click the rainbow circle button at the lower right-hand corner of the color window. This will close the screen. 6. To save your changes, scroll down to the bottom of the screen and click the green Update button. Your change will take effect immediately and will apply to all users of Broker Brain.